As the show caps is 2015-2016 run, check out highlights of a season like no other amid a wild presidential race. 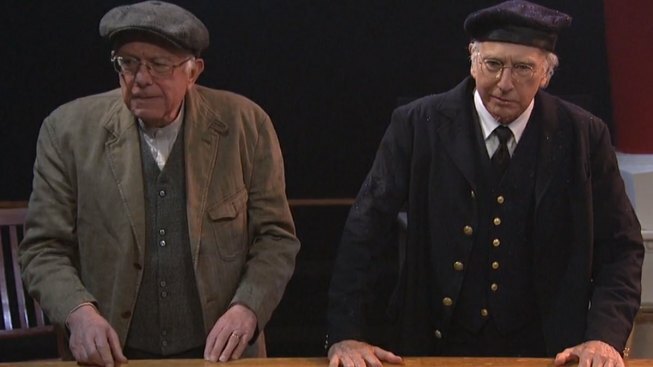 Democratic candidate Bernie Sanders and Larry David during a 'Saturday Night Live' sketch. The tale of two Hillarys that played out during a "Saturday Night Live" parody of "A Christmas Carol” in December epitomized the show’s efforts this season to satirize a presidential race that’s upended expectations, great and otherwise. In the sketch, Amy Poehler materialized as a ghostly visitor – her 2008 version of Hillary Clinton – who remarked to Kate McKinnon's contemporary rendering, "You’ve changed your hair!” But differences went far beyond the bob: The skit scored with the juxtaposition of Poehler's forced-smile Clinton against McKinnon's more intense model, who is working as hard to be liked as to win. The segment not only captured a changing dynamic in the campaign, but reflected an evolving approach by a show that began satirizing presidential electoral politics with the 1976 Ford-Carter race. Poehler returned during a season in which "SNL" figures of years past – Tina Fey as Sarah Palin, Darrell Hammond as Donald Trump and Larry David as Bernie Sanders – threatened to overshadow the current cast the same way Clinton, Trump and Sanders dominated attention amid a large field of candidates. Meanwhile, appearances by the prime presidential wannabes inhabiting characters other than themselves – Clinton as an earthy bartender, Sanders as an immigrant and Trump as a smarmy music executive while hosting in November – added a new level of surreality to the usual candidate cameos in a campaign year that's unspooled like a Reality TV show run amok. For "SNL," which ends its 2015-2016 run this weekend with Fred Armisen as host, it's been a season like no other amid a campaign that holds the same distinction. As the show gets ready to break before returning in the fall for the presidential race homestretch, revisit some of best of "SNL" comedy drawn from the some of the strangest of political times. The real Hillary Clinton appeared to be having fun as she played bartender Val to McKinnon’s uptight candidate. “Maybe you should take a vacation,” Val advised. Arguments over whether Poehler and McKinnon does the better imitation are pointless. Both, as this clip shows, succeed at capturing Clinton at different points. In this November sketch, the real Trump plays President Trump consulting close advisers (including Omarosa Manigault of “Apprentice” fame) during a 2018 Oval Office meeting. Sanders meets David as the candidate appears as a (Democratic) socialist immigrant on a sinking ship where the one percent seek special treatment. In the best "SNL" segment of the season, David stars in "Bern Your Enthusiasm," employing his Sanders imitation in a takeoff of his own HBO show, complete with the bouncy theme music.